If fantasy themed battle games are your thing, then this slot based on the same genre is right up your street. Bally Technologies have created an almost fantastical landscape for their game to be played out on. 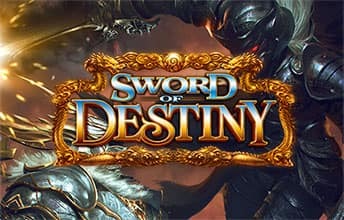 Enter the world of the Sword of Destiny and prepare to battle the forces of evil within, to retrieve your riches. Sword of Destiny is a 5-reel, 25 pay line slot, with a 95.94% RTP and a chance to expand the rows and pay lines as you enter some of the extras found in the game. There is a main screen above the reels which will hold a character from the games theme, however it is really only there as a design feature as opposed to anything helpful. In the background is a mix of a haunting forest landscape and a vast mansion both settled in darkness. Here symbols are switched for theme related icons such as a gold glove, a male and female warrior, a flask, scroll, necklace, castle and of course the evil knight. With the three character icons and the castle being the higher paying symbols and the rest making up the lower values. Bet Amounts – Betting on Sword of Destiny begins at 40p per spin and can be increased to the maximum of £360 per spin! Whilst the lines in play can’t be amended, they can change, although you will initially be playing with 25 pay lines. However, with the base game modifiers which will be explained below, your pay lines are increased to 50 with the addition of x2 extra rows. Wild Symbol – A glowing sword is your wild symbol on Sword of Destiny and it will substitute for all symbols except the bonus and the scatter. 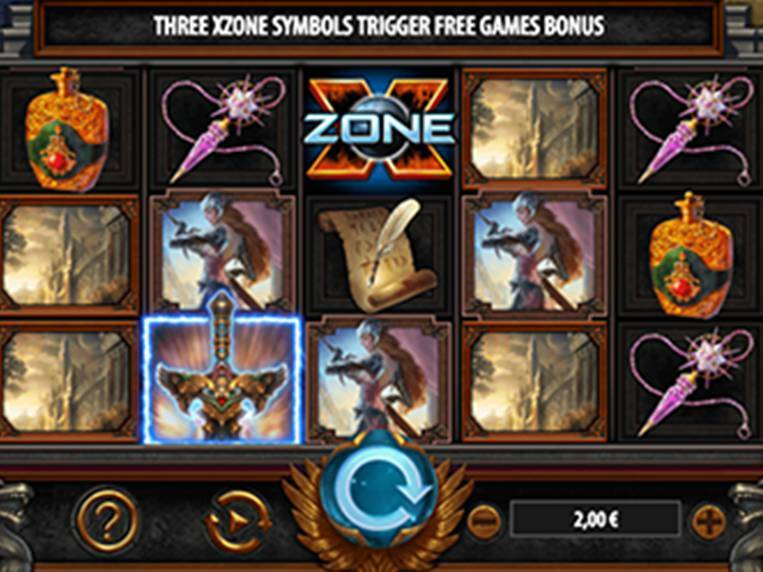 Scatter Symbol – Your scatter symbol is an X with the word zone in front of it, as to what relevance the X zone has to the game, we are unsure. But landing three or more of these anywhere on the reels will trigger the bonus spins. The X zone symbol will only appear on reels 2, 3 and throughout the whole game. Bonus Symbol – Sword of destiny has a third special symbol and it is a golden coin. This symbol will only appear on reels 1, 3 and 5, and landing three or more will trigger the bonus feature game. Base Game Modifiers Feature – Triggered at random there are 4 special game modifiers in play during the base game of Sword of Destiny. At any point the reels will expand by two more rows, adding x25 more pay lines to the pay structure and one of the following 4 features will activate. Clumped Wilds – between 1 and 2 reels will be filled with the expanded sword wild symbol. Random Wilds – wilds will be randomly added to reels, with between 4 and 9 wilds added. Picture Wilds – any of the four picture symbols can expand to cover adjacent reels and can cover between 4 and 10 spaces on the reels at any one time. Upgraded Symbols – at any point during the spin the lower value symbols, necklace, flask, scroll and glove will be upgraded. 2 or more of the lower symbols may be replaced with either the male or female warrior, the evil knight or the castle. Temple Tower Bonus Feature -This is triggered by landing three or more of the golden coin bonus symbol on reels 2, 3 and 4. Once this has been triggered you will be taken to a new screen and you will see a stepladder with 16 steps on it for you to climb. There will also be x20 coins on screen, of which you need to pick x3 to decide how far up the ladder you will climb. Each coin will have between 1 and 6 steps inside it, so choose wisely. Once you have completed your picks, you will move up the ladder to retrieve the prize at the level you have reached with your coin picks. Bonus Spins Feature – Land x3 or more X zone symbols on reels 1, 3 and 5 to trigger the bonus spins game. You will now be allocated with x8 bonus spins and an instant x2 your bet amount for that winning line. During the game each win will be allocated at random a multiplier that ranges from x2 and x10 the total bet amount. Any subsequent X zone symbols that land during this round will add 1 additional spin to the total. Sword of Destiny is a great game, although it probably plays better on mobile than it does on a pc or laptop due to the layout. Bally Technologies have put great effort into the character designs and imagery. But we would have loved something a bit more interactive, or some kind of integrated storyline. That being said the game was still fun and engaging. The addition of the extra reels during the base game modifiers was an interesting twist and the Temple Tower Jackpot game was very exciting to play through. Overall the game offered plenty of wins throughout the base and the bonus features, which made up for the lack of storyline and character integration.